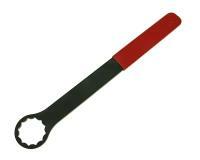 Assembly spanner for almost all steering bearing nuts from 32-41mm. Particularly flat design of the locknut makes adjustment and securing difficult with standard tools and the locknuts can be too loose or too solid. This tool is designed for the contours of the nut.